Build A New Park On The River Near Goose Island! On blustery Winter days, my friends and I often fantasize about Summers in Chicago- hanging out by the lake, traversing Michigan Avenue, and hitting the shops in The Loop. There is one other particular idea that comes to mind every time: Kayaking on the Chicago River. That idea, however, is usually shut down by our parents. It’s understandable though- Nobody wants their kids floating around unsupervised, especially when there are speed boats and barges to be dodged. So, is this the end all be all? Not necessarily. In my seminar, Great River Chicago, I found out about a little branch of the Chicago River open to only non-motorized boats. The branch flows around Goose Island to the East, and it’s a place where people can safely engage in water recreation. The problem is that before Great River Chicago, I had no idea that this place existed, and neither did any of my friends. We have an accessible place for recreation, but without visibility it’s virtually not there. If nobody thinks they can kayak on the river, they won’t. By not raising awareness of safe places like Goose Island’s East Branch, we are losing people who might otherwise love to come and enjoy the Chicago river. So just how do we make our little piece of River on Goose Island seen? We jazz it up! Jazzing up the East Branch of Goose Island would benefit not only the river itself if we plan it correctly, but the area around it too! More people coming to experience the proposed floating gardens, pools, and dining options directly on or next to this branch would mean more people in the area in general. These people would be prospective customers for small businesses, which would influence more of them to open in the area. Also, this park would just be an awesome place for the members of the community and the city of Chicago to gather. Not only is this addition economical, it’s beneficial to the environment! The team of scientists running the proposal, The Naru Project, would like the river to include a set of floating gardens. 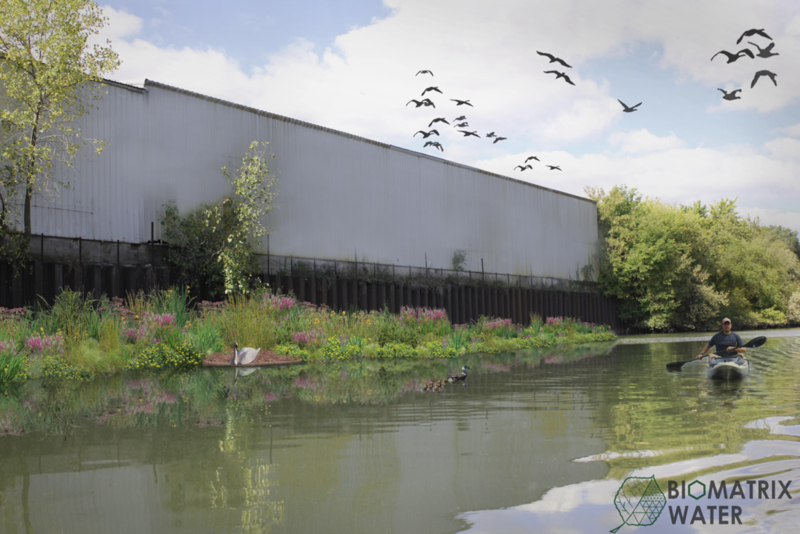 These floating gardens would be filled with native vegetation and attract wildlife on the surface. Under the water, they would provide a prime surface for microbe growth. This would be good because microbes work to break down water pollutants. All in all, this project would help us achieve a cleaner Chicago River! The Naru Project’s team is the closest to implementing this project. In fact, they already have a permit to do it from the Army Corp of Engineers! What they really need though, is funds. This currently independent project needs as much help from the community as they can get to implement this project, which is why they need more local media coverage. Many people in the know have expressed interest in the project, so we’re confident that it could be a reality. The problem is that not many people actually are in the know. The Naru Project is an open door for the community of Chicago. They have the permission and budding support. That budding support though, won’t be enough. 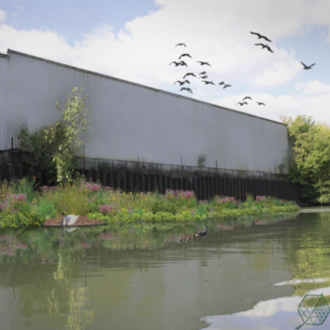 By raising awareness in and around the community, the scientists at The Naru Project can earn the funds that they need to create a beautiful park for Chicago that will do its part to beautify our great Chicago River. I would love to connect other orgs like the Peggy Notebaert Nature Museum. Hi Robert, Josh Yellin here, cofounder of this project. Please reach out to me at josh@urbanriv.org to discuss. How Did You Guys Come Up With This Idea?We Should Have a fundraiser Chicago quest and walter payton school. We have been researching the Chicago River and brainstorming for some time now. We are also really excited about the possibilities. Our team LOVES the idea of these fundraisers. Money is really the only thing holding us back right now. I have a couple of questions about your project. Like what are the types of dining you want to have on the rivers edge? Fine dining like Wishbone or more lax like a sandwich shop? Another question I had was in what ways do you plan to create awareness for this cause? Social media, word of mouth, posters? How do you plan to inform those who don't have access to these things? Lastly would this be offered to the public or would you make this more of a private area? Also, we plan to get the word out via email campaigns, radio interviews, and a big crowdfunding campaign this Fall. Hi Dejhari, Josh Yellin here, cofounder of this project. We are still developing ideas for public engagement at the rivers edge. Right now, most of our focus is on getting the floating riverbank installed with a wildlife-first focus. However, we are building educational curriuclum and have big ideas to engage the city in big ways once we get our first installation in the river--May 2017. This is an idea that I really want to see and hope this can really make an impact. We should have a fundraiser!!!!!!! I think that this is a good idea, and I would back it up in anyway I could. Great to hear! Please email me at josh@urbanriv.org and visit www.urbanriv.org for more info. This is a good idea to make the Chicago river a cleaner and safer environment. Thank you so much for all of the ideas and support everyone! To address a few questions, the park would definitely be open to the public, and is in Clybourne Corridor near a hub of public transportation. It would also be open to people who kayak down the river to it, so they could stop and grab something to eat. As for that food, it would be awesome to have a nice variety of quick things and maybe some picnic tables. The location is literally under the Whole Foods, so it might be cool once we raise the funds to ask them about opening up some stands. I think most of the stuff like that would be on a small boardwalk or a stationary barge. The people at The Naru Project also want to put an outdoor theater and a pool barge into the park. As for the gardens, they would be anchored to the bottom of the river and either along the sides of the park or scattered throughout so that visitors could row through paths and look at the wildlife. There would also definitely be a kayak rental there! I think this park could be really awesome, but it needs more awareness from the community. I believe local news coverage would be the best way to get the word out to the rest of Chicago, and maybe also talk to some other popular places in the field. I love the idea of talking to the Peggy Notebaert Nature Museum! This really is a project focused on connecting the community to the environment in a safe and green way, so it would be really huge if we could collaborate with people who do the same. Emma, you raise a great point about improving awareness of places for activities like kayaking. Communication is critical to get people to use an amenity. If this area were redefined as a kayak park, or something along those lines, who do you think could or should manage it? Great idea Emma, those who chose to support your idea won't be disappointed. I love the idea but would the farms clutter up the space or drift away? Maybe you should get a specific area for the farms. Hi Kyra, the floating riverbank will be securely anchored to the seawall... They will be concentrated and definitely will not float away. How did you know about the Naru project? Yes, please! We would love more governmental funding support. I agree with you, Emma, you want more awareness. You're also probably right to follow Robert's idea of speaking with the Museum. This is more likely to get traction if we can get Notebaert or another organization into the conversation. @Everyone - I love the enthusiasm! I am Joshua Yellin, one of the cofounders of this project. We now operate under the name "Urban Rivers" and we are making amazing progress. Anyone that would like to chat more, please email me at josh@urbanriv.org. @Emma, please email ASAP. Our team would love to hear from you!